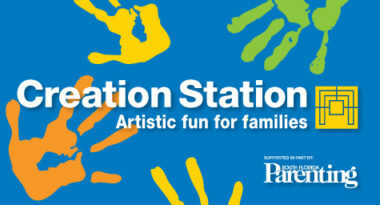 Exploring your personal creativity is the focus of Creation Station, a new monthly program at the Boca Raton Museum of Art. The Sun-Sentinel recently reported on how this arts and crafts experience is helping families develop a love of art. “The premise of the Creation Station is to make the visual arts more accessible and to engage intergenerational families in a playful and educational manner,” said Claire Elisabeth Clum, the museum’s curator of education. Each month, the Museum selects one art project related to a current exhibition. The projects are designed to be easy and quick to complete, yet advanced participants are offered more complex versions to challenge and expand their abilities. Museum volunteers are available to provide assistance. All of the necessary supplies are provided, and the projects can be taken home at the end of the class. Programs are usually scheduled for the third Saturday of the month and are free with Museum admission. The official schedule can be viewed online at bocamuseum.org or by calling the Museum at 561-392-2500. To discover unique strategies for promoting your museum or non-profit organization, contact MDG Advertising. MDG Advertising handles all advertising and interactive, collateral design, transit advertising and media buying for the Boca Raton Museum of Art, an enriching, non-profit cultural institution in Boca Raton, Florida. Read more at the SunSentinel.com.